Everest short trekking is a ten days trekking in Mount Everst region. And Everst short Trek offers a stunning view of some of the world famous mountains such as Everest, Lhotse , Thamsherku, Amadablam, Kantega, and Kwangde. We take a flight from Kathmandu to reach Lukla and then we trek to Namche bazzar, Everest view hotel and Tyanboche monastery. We may even go to charming Sherpa village for a trekking. Everst short Trekking offers you the breathtaking views of mountains and at the same time you will come to know many more things about the Sherpa culture. Everst Trekking is the prefect destination for all age’s people and it is most suitable trekking for those who can not afford more time for trekking in the high mountains. Everest Short Trek takes you near the mountains and we are quite sure that you can’t stop admiring the splendid view of mountains. We are many expectations that all Trekkers will come to see some of the world famous mountains such as Everest 8848m, Lhotse 8501m, Nuptse 7879m, Tawachee 6542m. You will also notice Tengboche monastery which is a religious center for all Sherpa living worldwide. Khumjung is the largest village which is situated on the foot of Khumbila Mountain, and with a maze of other peaks slowly begin to appear, like magic, before our eyes. We fly on a twin-engine Otter to the Himalayan foothills where we begin Everest short trek into the Khumbu region. The sights from the plane are amazing, providing dramatic views of terraced hills and the distant Himalayan giants. After landing in the village of Lukla , we meet the rest of our staff and porters and trek for about two and a half hours to Phakding. . We stay overnight at guesthouse. We continue trekking along the bank of the Dudh Kosi, crossing this majestic river many times on exciting suspension bridges laden with prayer flags. After entering Everest National Park , the trail climbs steeply with breathtaking views to Namche Bazaar, the gateway to the Khumbu region. We stay overnight at Namche bazzar. 05 Trekking in Namche Bazaar Acclimatization day. Today, we hike up the Syangboche Airport around Everest View Hotel for acclimatization for Everest short Trek, from this point, we can see rewarding views of the Himalayas with a stunning sunrise and sunset over the panorama of Khumbu peaks. Overnight stay at guesthouse with breakfast, lunch and dinner included with Tea and Coffee. From Namche the route turns west and the trail is almost level as we head up the Bhote Kosi Valley , once a popular trading route into Tibet . Along the way, we pass many prayer flags and mani stones, all indicative of the Tibetan Buddhist culture of this area. After descending to the Bhote Kosi the trail climbs steeply to Thame. From here, there are good views of the peaks of Teng Kangpoche and Kwangde. To the north is the Nangpa La, the pass leading to Tibet . Thame Gompa is situated above the village overlooking the valley and is the site for the spring celebrations of the Mani Rimdu festival. We stay overnight at guesthouse. we retrace our route down the Bhote Kosi Valley towards Namche and branch off to follow a quiet trail to Khumjung. It is a picturesque village which also has its own gompa at the top end of town. From our camping spot, we have excellent views of Thamserku, Kantega and Ama Dablam. We stay overnight at guesthouse. Trek from Khumjung to Tengboche (3867m.) which takes about five hours. The trail descends gently for early one hour to Sanasa (3550m.). 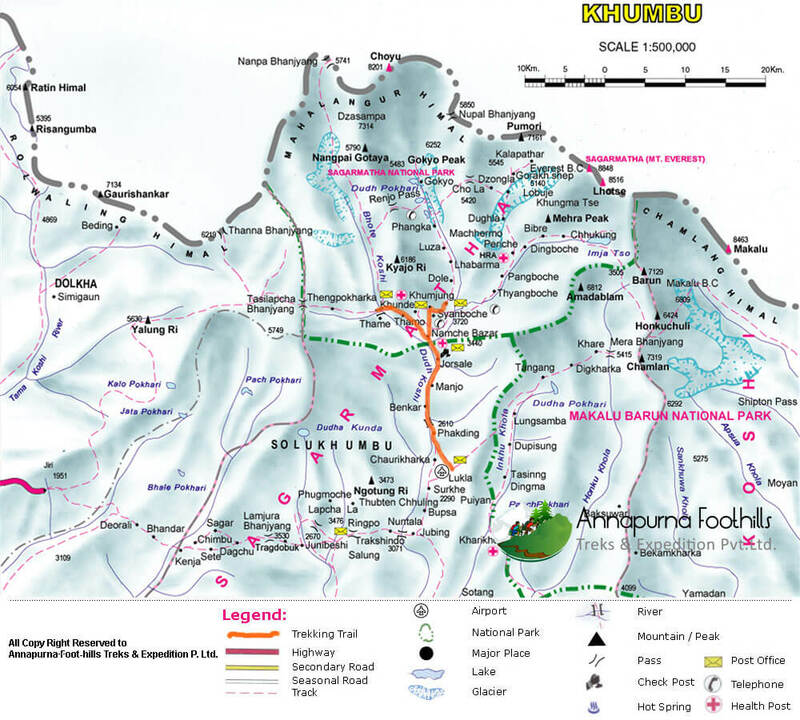 Now you have a glimpse of first really good views of the great peaks of the Khumbu including Mt Everest, Nuptse, Lhotse , Ama Dablam, Thamserku and Kusum Kangaru. Passing by several villages and numerous teashops, the trail descends steeply to a bridge over the river Dudh Koshi at Phunki Tenga (3250m. ).The village has an excellent place for lunch and you can take a short rest before making the steep climb to Tyangboche. Although exhausting due to the zigzag path, the trek has numerous attractions like rhododendron bushes, beautiful birds chirping and superb mountain scenery making your trek exciting. 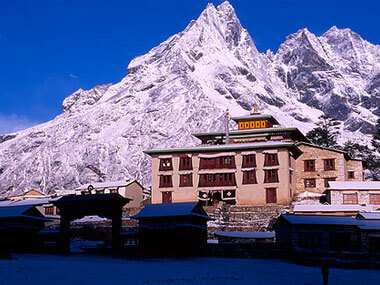 Tengboche is famous for its legendary monastery, the largest in the Khumbu region. . We stay overnight at guesthouse. Trek from Tengboche to Namche Bazaar (3440m.) which takes about four and half hours. From Tengboche, the trail descends steeply and slightly towards Phunki Tenga (3250m.) crossing the Dudh Koshi. Now you have a glimpse of panoramic views of the great peaks of the Khumbu including Mt Everest, Nuptse, Lhotse , Ama Dablam, Thamserku and Kusum Kangaru. Passing by several villages and numerous teashops, the trail ascends steeply to Sanasa where local Sherpa people sell the Tibetan goods. The way from Sanasa to Namche has small ups and downs with view of forests, scenery and mountains. We stay overnight at guesthouse. Trek from Namche Bazaar to Phakding (2652m.) and it takes about four hours. The trails descend steeply for early one and half hours. After that, the path has small ups and down to Phakding through Monjo. We stay overnight at guesthouse. Trek from Phakding to Lukla [2886m] and it takes about three hours. Your final day's trekking follows the Dudh Kosi back down to Lukla. The trail then continues back towards Lukla, where we will reconfirm our flight tickets for the next day and spend the night. This last evening in the mountains is the ideal opportunity for a farewell party with the sherpa guides and porters, where you can sample some chhang, try Sherpa dancing and look back on a memorable trekking experience and staffs are expecting for precious Tips . We stay overnight at guesthouse. After breakfast, our city guide reaches in Hotel with Vehicles, and then we drive to Bhaktapur Durbar Square . Bhaktapur is one of the oldest cities in Kathmandu valley. It is well known as Living Museum . Old brick paved enclave of old Royal palace, Nyathapola Temple , Datatriya temple, exquisite artwork offers a picture of the grandeur of medieval Nepal . And Patan is located 7 km away from Kathmandu ; this city has many 15th to 17th century, Hindu and Buddhist, monuments built during the Malla dynasty. The most important area with many monuments is the Patan Durbar Square . Overnight stay at Hotel. Sightseeing tours in Kathmandu can be arranged upon your request (Click for tour in Kathamndu).